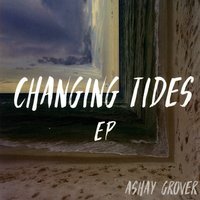 : Changing Tides is Ashay Grover’s first EP and second recording project. The EP reflects on a coming of age period in Ashay’s life, as the EP provides listeners with very significant changes in mood. Primarily comprised of acoustic songs, Ashay’s goal in creating this project was to identify the depth that can be provided in simplicity. The EP can best be described as: deep, simple, and catchy. The music was recorded in the basement studio of a close high school friend, Matthew Renzo. This also marked the first major recording project Matthew recorded. Each song contains feelings of anger, joy, regret, optimism, and faith – as these emotions blend together into the dynamic of each song. The EP is marked with slick guitar licks, very emotional lyrics, and catchy chord structures. The name “changing tides” relates to the idea that at times struggles, emotions, and hardships are uncontrollable; essentially, you cannot “change the direction of a tide”. That is to say, sometimes life can be uncontrollable, and things will always come and go. Rather than attempting to do what cannot be done, it’s best to move forward. The primary focus Ashay has in mind is to display that anyone can pursue their interests regardless of what these particular interests may be. Music does not require expensive instruments, a fancy recording studio, or an immense amount of capital. At the end of the day, Ashay and Matthew are ordinary guys, with ordinary career goals; yet, they’ll always have a strong love for music.